A little boy with cerebral palsy is unable to communicate with words, but his huge smile is all it takes to convey the sheer excitement he feels about finally being able to go to Disneyland. This morning, nine-year old Kai Gotro was flown from a small Canadian town to California, where Kai’s long-awaited dream will come true. Kai was born with spastic cerebral palsy, which is a motor condition that causes physical disability in development. Kai’s cerebral palsy is quadriplegic and dystonic, meaning he cannot use his arms or legs and he suffers from sustained muscle contractions that cause twisting and repetitive movements and / or abnormal postural positions. Although Kai has many physical challenges, he can fully comprehend the world around him. He has favorite television shows and is finally beginning to learn to express his ideas with help from his speech pathologists and a special computer. The DreamLift is a lot of fun for the children, and it helps to stimulate them. Kai’s grandfather, a retired school teacher who has experience with special needs children, said that when a person has cerebral palsy, many people can’t see past the person’s physical limitations to understand the fully cognitive and thoughtful human being in front of them. Kids with cerebral palsy are often underestimated; however, they need the same stimulation as other children in order to fully develop. Spastic cerebral palsy is the most common type of cerebral palsy, occurring in about 70 – 90% of all cases. Normally, muscles coordinate in pairs, which means that when one group of muscles contracts (tightens), the other group relaxes. This is what allows a person to move about freely. When a person has spastic cerebral palsy, complications in communication from the brain to nerves to muscles occur, and this causes problems with balanced muscle tension and muscle movement. In spastic cerebral palsy, muscles do not coordinate together. Instead, different groups that are supposed to relax and contract together become active at the same time, which prevents coordinated movement. The muscles in children with spastic cerebral palsy are constantly stiff, or spastic, which means they have stiff, jerky movements stemming from an abnormally high muscle tone. The degree of spasticity is different from child to child. Balance problems and stiffness in body movement can range from barely noticeable to misalignments so pronounced that the child needs crutches or a cane to assist in being upright. Spasticity also can be so severe that the child has to use a wheelchair. Above the hips, children with spastic cerebral palsy often retain normal or near-normal muscle tone and range of motion, though some spasticity may also affect the upper body. Because leg tightness often leads to instability when in an upright position, children with spastic cerebral palsy can develop extra muscle tension in their upper body, shoulders and arms due to the upper body trying to compensate for the instability of the lower body. Although it is caused by a brain injury, spastic cerebral palsy can be thought of as a group of orthopedic and neuromuscular issues due to the way the symptoms manifest over the course of a person’s life. Spastic quadriplegia – especially if combined with verbal challenges and eye problems – may be misinterpreted as intellectual and cognitive disabilities in the child. It should be understood that the intelligence of a person with any type of spastic cerebral palsy is unaffected by the condition of the spasticity itself. Spasticity is simply a description of the movement disorder caused by the brain damage. An injury in the brain can cause spastic cerebral palsy without causing cognitive / intellectual problems. However, oftentimes a baby sustains a brain injury that causes damage to multiple areas of the brain, and the child can be left with spastic cerebral palsy as well as other conditions, such as intellectual disabilities and developmental delays. Hypoxic ischemic encephalopathy (a lack of oxygen in the brain that causes brain injury) is a form of brain damage that can cause spastic cerebral palsy as well as other conditions in a baby, such as seizure disorders. Children and adults with any type of cerebral palsy need stimulation. Research has consistently shown that there are numerous benefits to therapies for people with cerebral palsy. These therapies include camping, playing sports such as baseball, riding horses and bicycles, therapy in the water or with animals, acupuncture, yoga, body work and massage, and neuromuscular electrical stimulation. Camping and other activities traditionally thought of as being available only to physically active persons are tailor made for children with cerebral palsy and special needs. Even children with spastic quadriplegia can play baseball and be involved in horse therapy, thanks to special volunteers and specially created playing fields and trails. Indeed, sports and activities provide stimulation and numerous cognitive, social, emotional and physical benefits for children with cerebral palsy and special needs. When the activities make these children smile and feel independent, the benefits are immeasurable. Reiter & Walsh ABC Law Centers is proud to call Detroit, Michigan home. 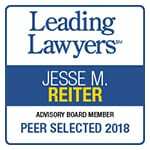 We are a community-focused firm and have received numerous awards for our advocacy of injured children. Birth injury cases can be very complex, which is why it is imperative to have an experienced attorney by your side. 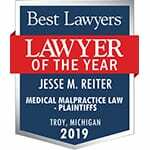 Award winning attorney Jesse Reiter has been focusing exclusively on birth injury cases for over two decades. If negligence caused your child to have spastic cerebral palsy, Jesse and his nationally recognized team can help you obtain the compensation your child needs for lifelong treatment, therapy and a secure future. Email or call us at 888-419-2229. 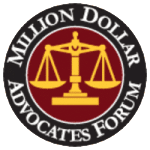 We have numerous multi-million dollar verdicts and settlements that attest to our success, and no money is ever paid to our firm until we win your case.